Greetings of Peace to you all. As-Salamualikum wa Rahmatullah wa Baraktuhu! Special Peace and Never Ending Grace and Chosen Blessings of the Glorious One be yours. 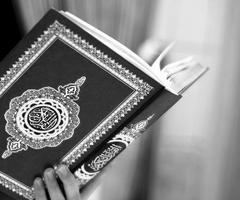 “...Many people, especially non-Muslims, who read the Quran for the first time are struck by what appears as a kind of incoherence from the human point of view. It is neither like a highly mystical text nor a manual of Aristotelian logic, though it contains both mysticism and logic. It is not just poetry although it contains the most powerful poetry. One of the most eloquent author of Sufism in modern time, Henry Bayman draws a wonderful analysis, borrowing comparison from Quantum Physics, how the deceptively simple yet multilayer meanings enfolded in the verses of the Qur'an are like holograph. "Holograph (or hologram) is produced like this: Split a beam of laser light, allow one part to be reflected off an object - for example, a rose - recombine the reflected and unreflected parts, train them on a photographic plate, and you obtain a holograph... The holograph of a rose is very different from the photograph of a rose: it does not look anything like the rose at all. In fact, it does not remotely resemble any object, but is an abstract pattern of interference fringes. Yet when one shines a beam of laser light through the holographic transparency, one obtains a three-dimensional image of the rose. Cut the holograph of the rose in two, shine a laser beam through either part, and the whole image of the rose reappears, albeit reduced in size. Repeat the process of cutting, the result does not change. In fact, information about the entire rose has been encoded into every tiniest section of the holograph." In explaining how Scientist Bohr used analogy of how the universe is holographic in attempts to describe it's reality, Henry Bayman points out: "In this view, the principle behind a hologram applies to the universe at large. Information about every part of the universe is enfolded into every other part. In other words, at bottom the universe is undivided, indeed indivisible. If we use the word “atom” in its original sense ('a'-no, 'tom'-parts), the universe is the only true atom." Connecting the characteristics of holograph, construction of the universe and the nature of the Koran, the author goes on to comment: .. "The Koran may be structured in the same way as the universe: it may be holographic.... Some Sufis might even aver that the heavenly archetype of the Koran, the “Mother of the Book” or “Guarded Tablet,” constitutes the DNA of the universe itself. God’s light (and God is Divine Light, “the Light of the heavens and the earth”), passing through the prism of the Guarded Tablet, projects the universe (after passing through multiple layers of existence) as a four-dimensional spacetime bubble. This Cosmic Blueprint then becomes actualized in the myriad phenomena that meet the eye." Here is a Reading from the Quran of it's 50th Chapter that begins by a Single Letter Qaaf and hence it is called by that very Name: Surah Qaaf. The translation is not literal translation, neither any single translation of Qur'an is free from defects - but this one is done with the intention of fluid reading for English language as much as possible. You may read and hear the original text in Arabic with transliteration here: Quran: Surat Qaf. Qaaaf – By (the solemn declaration of) the Glorious Quran. The Supreme Reality now speaking, fully knowing how much of them the earth consumes – for with the Divine Authority is a Perfect Recording that preserves (all knowledge and even the tiniest bits of data and information). Ah! (The truth of the matter is that) they, (those who have sickness in their heart so they do not perceive the reality) denied the truth when it came to them, so they are in a state of confusion. Have they not seen the sky above them, how the Divine Designer has built it and decked it out fair, so that it has no flaws? (Do they not look) at the earth - the Supreme Architect spread it wide and set firm mountains in it, and caused to grow in it every beauteous species - a vision and a reminder for every devotee who turns to the Reality. And The Supreme Planner send down blessed water from the sky, and cause to produce with it gardens and harvests of grain - and lofty palm-trees laden with spathes, cluster over cluster - to serve the servants for sustenance. And by means of this water the Divine Master raises the dead land to life. This is how the Resurrection (the coming forth from death) shall come to be. (Many previous generations) such as the community of Prophet Noah denied (the Hereafter) before and so did the people of ar-Rass, and the tribes of Thamud (rejected the Messengers sent). And the (the people of) Ad and Pharaoh and the kinsmen of Prophet Lot. And the People of the Thickets (of Madyan) and the folk of Tubba - all of them rejected the Messengers (of God) so My threatened punishment duly befell them. How you delude! Are the Supreme Creator worn out by the first creation (that He will not be able to resurrect them the second time)? Look how they are in doubt about the new genesis! The Glorious Creator created the human being and know what whispers in his mind. The Incomparable Reality is nearer to man than man's jugular vein, his physical reality. Behold, the two recording (agents) record - situated on the right and on the left - and man utters not a word but there is a watcher present (to record). The stupor of death is truly to come. This is the thing which you sought to escape. And the Trumpet shall be blown. (It shall be announced:) "This is the Day, the warning of which has (already) been given." And every soul shall come forth (to account for his/her deeds), and will be accompanied by (an angel) who shall drive it and (an angel) who shall bear witness. A Voice shall cry out, "You were heedless of this, so God has removed from you your coverings (and veils of deception and thus) today your perceptions are sharp." And his (other angel) companion (who will come to bear witness) shall say, "Here is (the record of his deeds) ready with me." (It shall be commanded by the Perfect Authority on that Day) "Throw in to Gehenna (Hell, station of Divine Wrath and Retribution) every hardened denier (of truth), forbidder of good, transgressor, entertainer of doubts, who sets up (to worship) another deity (such as idols, false gods, money, fame, power) beside God, the One and Only without a second, Absolute, Transcendent and free from every imperfection. So cast into the terrible punishment." (The disbeliever will blame) his (evil) associates (who) will say, "O our Lord! It was not I that seduced him to transgress but he himself was deeply sunk error." God, the Supreme Authority shall speak, "Dispute not in My presence. I had already given you the warning of this beforehand. The Word from Me shall not be altered, and I Am not at all unjust to My servants." On that Momentous Day the Divine Voice shall ask the Hell, "Are you filled?" and it shall say, "Are there yet more?" And the Paradise, the Garden enclosed, both enwrap and enrapt in Absolute Divine Mercy - shall be brought near to those who had become secure against evil. It shall be announced: "This is that (Paradise) which you were promised, for those who turned (to their Lord) again and again (seeking His Mercy) and observed (His laws) with care. Those who stood in awe of the Gracious God in the heart of their hearts, even unseen and came to Him with a heart turned in sincere devotion (to Him). (Invitation shall be called out:) "Enter this (Garden) in peace. This is the lasting (reward) for ever." They will have there all that they desire and the Divine Bestower has in store much more (to present to them). And how many a guilty generation did the Divine Authority finished before, that was stronger in power and might than they, but (when the Divine Wrath came) was there any asylum (for them) to take refuge? (there is no other refuge ever but God, the Supreme Refuge for ever and ever). Truly in that there is a reminder for one who has a heart or one who listens attentively and is a witness (to truth). And verily, the Divine Power created the heavens and the earth and everything between them in six cycles (in stage, one after another, evolution being one of the mechanism), no weariness touched God (as falsely claimed by some). So bear in patience being steadfast with what they say, and extol the glories of your Lord, Absolute Holiness is His, before the rising of the sun and before its setting. And celebrate His praises during parts of the night and at the end of the prostrations (of submission before Him). (Reader) hearken! On the day when one that calls will call from a near place - the day they hear the inevitable mighty blast, that will be the day of coming forth (from the graves). It is the Divine Authority Who gives life and cause death and to the very Authority is the (final) Homecoming - the Day when the earth is cleft from them and they hasten forth. To raise them to life and this assemble of humanity together - that is easy for the Almighty Divine Power. The Lord is most aware of what they say, and you can by no means force them (to believe). So remind by the Qur'an, the Final Message to humanity, whoever fears My Threat (that must come to pass, for promise of God is ever true). End of translation of the 50th Chapter, Qaaaf. Dear Allah. I pray that whoever reads this shall have Your Comfort, Your Joy, Your Peace, Your Love, and Your Guidance. For You alone is the Source of comfort, joy, peace, love and guidance. I may not know their troubles, but You do, for nothing in the heaven and earth escapes from Your all-encompassing knowledge. Please keep protecting us by Your Infinite Compassion and Deep Love. Ameen.